Available in shoe and boot styles, Keen Men's Targhee II is the ideal hiking partner. The rugged Targhee II gives you the comfort and support of an athletic shoe and the resilience and protective features of a rough-and-tough hiking boot. This style keeps your feet dry and your step steady thanks to a waterproof nubuck upper, 4-millimeter multi-directional lugs, and a Keen.Dry waterproof membrane. And for exceptional support mile after mile, the Targhee II combines an S3 heel structure with a dual-density, compression-molded EVA midsole and a Keen Metatomical EVA footbed. 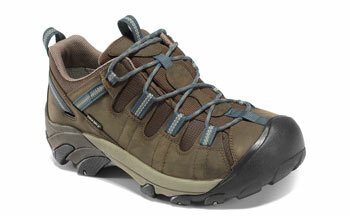 Keen Men's Targhee II Hiking Shoe.